Huayna Picchu is located north of the Inca city – Machu Picchu. To reach Huayna Picchu, it follows the path that starts a few meters from the sacred rock, the road is very steep and includes flights of stairs and steps. For many people climbing Huayna Picchu is one of the highlights when visiting Machu Picchu. The hike up is between 45-60 minutes depending on the physical state of the person. The stunning beauty of this natural attraction makes it a must for those who want an unforgettable memory of the citadel visit. Although access is a bit hard, but the view is breathtaking and worth the effort. From a distance the mountain looks impossible to climb without the necessary tools. There are parts you need to be able to climb and crawl through tight spaces. They do not warn you about any of these obstacles, most people might believe it’s just a hike up a mountain, but it is way more than that. Once you get to a certain point it breaks off into two trails. One is shorter and leads back to Machu Piccu (easier) on the other one you get to see the great cave and the temple of the moon but it is extremely steep. There are two points you get to wooden, hand made ladders. The ladders are steep one goes down the side of the mountain the other you have to climb up the side of the mountain. The views of the Citadel and surrounding landscape are extraordinary from the top and well worth the climbing effort. In some spots you are on narrow stairs with the steep drop next to you. The view is amazing from the top! . 1 What does huayna picchu mean? 2 We can found ruins in Huayna Picchu? 3 What kind of timetable exist to visit Huayna Picchu? 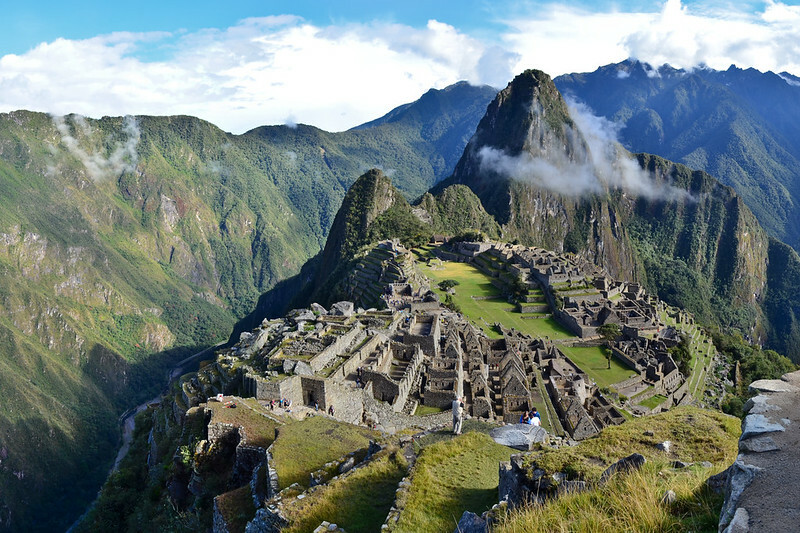 4 Entrance tickets to Machu Picchu, Machu Picchu mountain and Huayna Picchu are limited? 5 What is the price of entrances to visit Machu Picchu , Machu Picchu mountain and Huayna Picchu? 6 What are the permits and rules to climb Huayna Picchu? 7 Which time is better to climb Huayna Picchu – 7 am or 10 am? 8 What are the Alternatives to climb Huayna Picchu? 9 How Fit Must You Be to Climb? 12 It is dangerous to climb Huayna Picchu ? 13 Difference between the mountains Machu Picchu and Huayna Picchu? Huayna Picchu (aka Wayna Picchu or Wayna Pikchu), which means ‘Young Peak’ in Quechua, is the large mountain that sits directly behind Machu Picchu, and can been seen in all it’s glory in the picture above. We can found ruins in Huayna Picchu? “Huayna Picchu mountain” gives the property to archaeological geographic image to Machu Picchu. On top of this mountain there are many buildings over the edge that were used for crops species, perhaps considered sacred. They remain of a temple, which is not known whether it is a building that ultimately was not completed or was partially destroyed are also observed. From there you can see the main square of Machu Picchu about 400 meters down, the overall picture is impressive Urubamba river canyon of infinite shades of green and the background snow-capped peaks. What kind of timetable exist to visit Huayna Picchu? – Second group: Machu Picchu – Huayna Picchu 10:00 to 11:00 a.m. Entrance tickets to Machu Picchu, Machu Picchu mountain and Huayna Picchu are limited? Group 1 ticket Huayna Picchu (07h00 to 08h00): 200 spaces; Ticket Huayna Picchu Group 2 (10h00 to 11h00): 200 spaces. Mountain ticket Machu Picchu First Time (07h00 to 08h00): 400 spaces – Second ticket Machu Picchu Mountain Time (09h00 to 10h00): 400 spaces. Museum ticket Machu Picchu: It has limited capacity. What is the price of entrances to visit Machu Picchu , Machu Picchu mountain and Huayna Picchu? What are the permits and rules to climb Huayna Picchu? In the early days trekkers were able to climb Huayna Picchu without any permits and there was no limit on the number of visitors on the mountain. As you can imagine unregulated climbing on the mountain had a rather large impact on the Inca paths that lead up the trail, as well as interrupted some of the archaeological work that continues on the mountain even today. Not to mention the safety risks associated with having lots of people coming and going on steep paths. A few years ago, the National Institute of Culture of Peru (INC) decided to implement a number of measures to regulate climbing activities on Huayna Picchu. Initially a quota and permit system was implemented that limited the number of climbing permits to 400 per day. Climbers could still ascend and descend at any time of the day as long as the final ascent was two hours before the site closed. On the 25th July 2011 the ruling on timings changed, and fixed times of departure have been implemented. There are now two group departure times, each with 200 permits. The first climbing time runs between 7am-8am, and the second group time runs from 10am-11am. The climb itself takes about an hour to ascend and approximately 45 minutes to descend. Officially, climbers in the first group need to get back down from the mountain by 10am to avoid cross over with climbers ascending in group 2, but this is very seldom the case as many trekkers take longer to ascend and then like to stay up high to maximise the view, particularly if there is early morning fog that promises to leave by 10-11am. Which time is better to climb Huayna Picchu – 7 am or 10 am? The 7am time is a cooler time in the day, particularly during the dry season when temperatures can get quite hot by the time the 2nd group departs. However, there is a higher probability of encountering fog in the early mornings which can completely obscure the view from the top of Huayna Picchu. On a clear day though the early morning view is amazing. A key factor is getting the timing right to avoid crowds. Non-trekkers arrive by train from Cusco around 11am. So if you take the early morning time slot you run the risk of getting off the mountain just as the tourist hordes arrive. That being said the mountain is quieter early in the morning. You don’t have to contend with any one coming down off the mountain and there is usually only a small group of people at the top at any given time. If we were pushed though we would recommend the second time slot as it gives you a chance to tour the Citadel before tourists from Cusco arrive, as well as reduces the probability of encountering fog which can totally negate the purpose of climbing Huayna Picchu. Moreover, by the time you descend Machu Picchu many visitors have departed for lunch. This can all be academic though if you don’t book early enough and are forced to choose only one of the available times, or worse, denied access as permits are sold out. But don’t fret, if permits are sold out there are alternatives to climbing Huayna Picchu that provide great views. What are the Alternatives to climb Huayna Picchu? There are three main alternatives to getting a birds eye view of Machu Picchu – Cerro Machu Picchu (also know as Machu Picchu Mountain or Montaña), Putukusi Mountain and The Sun Gate. Here we briefly discuss each. Cerro Machu Picchu (or Machu Picchu Mountain) is the largest mountain that rises out of the site’s complex and sits directly across from Huayna Picchu. The climb up Cerro Machu Picchu is nearly twice as high as Huayna Picchu but has a more gradual ascent profile up to it’s summit at 1,850 feet (~620m) above the city ruins (3,051m above sea level). The views from the top are fantastic (arguably better than Huayna Picchu), as the visual angle is more gradual and the ruins more exposed. The trail is also a lot quieter than Huayna Picchu so you won’t need to worry about crowds. It takes an average trekker around 2/2.5 hours to hike to the summit from the ruins and just over an hour to return. The best time to start a trek up Cerro Machu Picchu is around late morning (permits run from 7am-11am), this way you can complete your guided tour of the city and still get back in time before the site closes. Ideally, if you are lucky enough to be spending two days at Machu Picchu, this trek should be kept for your second day. The route is good for families with children as the gradual and less rocky path is easier to navigate than Huayna Picchu. To reach the site you will need to walk towards the Sun Gate, about halfway along this trail, just past the Caretakers Hut, you will see a sign directing you to Machu Picchu Mountain. If you are lucky enough to have two days in the Machu Picchu Sanctuary and have an adventurous soul, then the Putukusi Mountain (or Happy Mountain) trek from Aguas Calientes is definitely worth a shout. This trek is not for the faint-hearted though and is much more challenging than Huayna Picchu or Cerro Machu Picchu. To access the route trekkers need to follow the rail tracks from Aguas Calientes towards Machu Picchu. A little way on you will see a sign for Putukusi off to the right. From here the route follows a steep incline of 600m over stone steps and up ladders – the largest ladder reaches 60m and should be approached with caution. A fall from this height can be fatal. The final stretch to the summit zigzags along a steep hill. In total the hike takes about 1.5-2 hours to ascend and a similar time to descend. The views from the top are great and the trail is often deserted or very quiet. If you are trekking on the classic Inca Trail then the Sun Gate (or Inti Punku), is the first site that you reach as you approach Machu Picchu. It provides fantastic views of the city. For trekkers who arrive at Machu Picchu using alternative trails, or for visitors from Cusco, the Sun Gate is reached by entering the Citadel and then backtracking along the Classic Inca Trail past the Caretakers Hut to Inti Punku (it is well signposted). It takes about an hour each way and is an uphill strenuous hike on the way out to the Gate. Many trekkers and visitors to Machu Picchu try to get the first bus up to the city so that they have enough time to backtrack along the Inca Trail to the Sun Gate to witness the sunrise. How Fit Must You Be to Climb? Climbing Huayna Picchu is physically challenging. The peak of the mountain is about 2,720 meters (8,920 feet) above sea level, and about 360 meters (1,180 feet) above Machu Picchu, where you will begin your climb. This can be difficult for the less-in-shape among us, but don’t let it scare you away–even if you’re a bit overweight or on the older side, plenty of people just like you have climbed Huayna Picchu successfully. The most important tip is to simply take your time and, if necessary, to stop and allow others to pass you without getting flustered. Nearing the summit of Huayna Picchu, there is a narrow tunnel you must navigate through that looks something like the picture next to this text. Apparently, this feature was built into the path by the Incas; the idea was that it would act as something of a “choke point” for any invading forces attempting to make their way up the mountain. We imagine that it would have worked quite well–it’s a small space, and there are points where some people find it necessary to crawl on hands and knees. This can be especially difficult if it’s raining or shortly after a rainfall, as water is known to drop through the cave’s roof and run down its walls. This can make the cave portion of the trip significantly more slippery. The peak’s famous “death stairs” are not quite as scary as some might have you think. That being said, they’re no walk in the park either. Most visitors assume that the climb will be more intense going up, and the presence of this staircase at the start of the descent throws many for a loop. It’s quite an extreme set of stairs, reaching an angle of over 60 degrees at some points. There’s also no railing to hold on to, so we recommend a lot of caution when navigating this section of the Huayna Picchu descent. Despite the impressive nature of this stair set, they’re actually less difficult than some stairs going up. What can be overwhelming for visitors regarding the “death stairs” is the sense of vulnerability created by a lack of railing coupled with the view in front of them, which can create the sensation that a misstep could result in a never-ending free fall to the valley floor below. But don’t worry–thousands of visitors have navigated the stairs at Huayna Picchu before you without problems, and you can do the same. It is dangerous to climb Huayna Picchu ? The Inca Trail to Machu Picchu can be a tough trek, and it takes a few casualties each year. But the real danger begins when you follow the trail past the mythical city and up Huayna Picchu, aka the “Hike of Death.” The old Inca staircase is carved out of granite and climbs about 1,000 feet in less than a mile. Plus, the route is full of rotting, crumbling rock, slippery stones, and exposed corners. Many people tackle the route totally unprepared—we’re talking flip-flops and no water. Clouds and mist make the journey more difficult, and in some sections hikers must cling to old steel cables. Going up is the easy part. Coming down the steep slope often paralyzes travelers with fear. But it’s worth the pain—the view from Huayna Picchu on a sunny day is the best bird’s-eye view of Machu Picchu below. Difference between the mountains Machu Picchu and Huayna Picchu? Huayna Picchu mountain is appearing behind Machu Picchu in his classic picture postcard; their Inca trails built on the side of the mountain, can be frightening for people with fear of heights; these will circulate next to depths of hundreds of meters, they are steep and narrow; with some sections that have to be subject to safety cables for balance; It is a challenge for anyone. If you suffer from vertigo or can not control his fear of heights, you’d better skip this mountain. Machu Picchu mountain, offers less steep, wider and less visually frightening ways. When booking tickets Machu Picchu think of all the people who come with you, this walk is ideal if you come with children or elderly. The trails of the mountain Machu Picchu offer long periods of time without seeing anyone; very different from Huayna Picchu, which will have to wait their turn to use the path. Both paths have almost the same distance (about 2 km), however, the hike to the top of Huayna Picchu is more vertical than the Machu Picchu Mountain and will take less time. The mountain Machu Picchu is one of the most amazing hiking in Machu Picchu; however, if you can overcome his fear of heights, we recommend booking the mountain Huayna Picchu, you may change your life completely after reaching the top. Walk Distance: 2 km, steep and narrow roads. Location: North of Inca city of Machu Picchu. Way Description: The trails are quite steep, ropes need to overcome some parts of the road. It will traverse stairs built on rock and wooden stairs; the road is visually frightening. Access: From the Inca city of Machu Picchu, the Sector of huayranas (Sacred Rock). Here you will find the control booth entrance to the mountain. First Group: 07:00 hrs. – 08:00 hrs. Second Group: 10:00 hrs. – 11:00 hrs. Number of visitors: 400 per day, divided into two groups of 200. Walking time: 2 hours and 30 minutes (up and down). Degree of Difficulty: Moderate high. It’s a steep mountain with cliffs and lots of steps (not recommended if you suffer from vertigo). Archaeological attractions: Andenería and the amazing Temple of the Moon, built inside a natural cave. Flora and fauna: jungle landscape, lush vegetation, which provides habitat for birds, butterflies and insects. Advantages: Some of the best views of the city and the amazing Inca mountain setting where it is located. Walk distance. 2 km, will amount to approximately 300 m. vertical. Location: Waterfront Huayna Picchu and to the left of the Traditional Way. Way Description: Abundant vegetation, wild orchids stand. The wide trails will allow cross them calmly. Access: From the Complex of Machu Picchu, climb to the viewpoint (house keeper) continue until the diversion is indicated with a sign. Second Group: 9:00 hrs. – 10:00 hrs. Number of visitors: 800 spaces per day, divided into 2 groups of 400. Walking time: 3 hours (round trip). Degree of Difficulty: Moderate / high. Flora and fauna: find variety of orchids, butterflies and birds. Advantages: less steep trails, panoramic views of the City Inca and Huayna Picchu Mountain. How far is Machu Picchu from Lima?